On Thursday, March 1, 2018, Khenpo Lobsang will kindly join us from Vajra Vidya Retreat Center in Crestone, CO. He will lead us in a morning fire puja at the Kagyu Mila Guru Stupa on this auspicious day of Mila Repa's Parinirvana day. If interested, please join us at 9:30 am. Thursday, March 1, at the stupa, just east of 19 Northstar Road. We will then have a potluck lunch at the Herman Rednick Center with Khenpo-la at noon. If there is time before or after lunch, Khenpo Lobsang will give us lo-jung teachings that he recently received from H.H. the 17th Karmapa. ABOUT THE TEACHER: Khenpo Lobsang Tenzin was born in Bhutan in 1969. He entered the monastery at the age of 9. At 22 he entered shedra, completed the 5-year course of study, became Khorpon, then Lopon, and in 1996 Khenpo. He received full ordination in 1985 from Ven. Thrangu Rinpoche. For ten years he was Director of Vajra Vidya Institute in Asia. He has studied in all four lineages, is a Rime scholar, and teaches warm-heartedly from the synthesis of Buddhist lineages. In 2004, Ven. Thrangu Rinpoche appointed him as the principal Professor and Director of all his monastic colleges. He teaches at all Thrangu Rinpoche's centers worldwide. In 2009 he went to England where he studied English at Oxford. For a full biography of his many accomplishments please visit this link. Having attended shedra with Khenpo Jigme, he and Khenpo Jigme have known each other for 30 years. 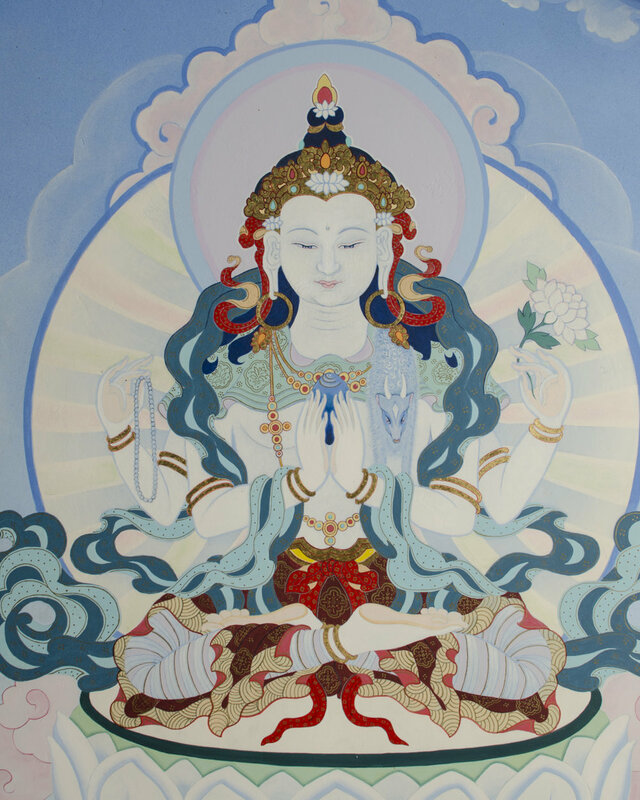 We are so fortunate that they are the resident Khenpos at Vajra Vidya Retreat Center in Crestone CO, and that they come to share the Dharma with us. Suggested donation: $15.00. No one turned away for lack of funds. All are welcome. For location, contact Olga at (575) 586-1055. FALL 2017 puja and flag-raising: PICTURES! With Khenpo Jigme we met for a fire puja and flag raising. Auspicious visit from Lama Lodu Rinpoche to our center! About 18 people, many new to the Earth Journey sites and programs, came to the Friday evening public talk, held at the Earth Journey Meditation Temple. 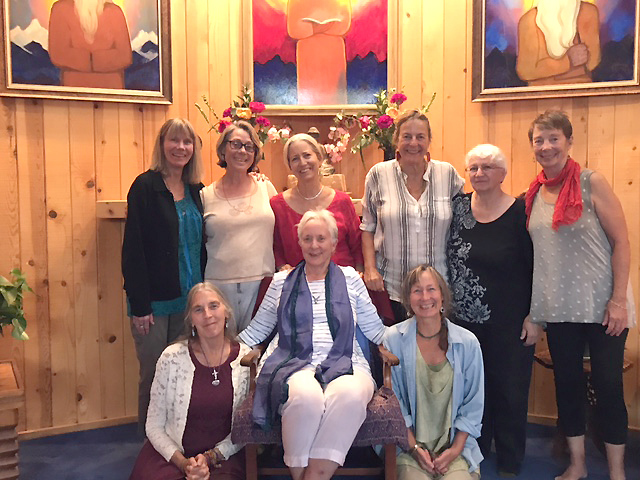 Nine retreatants attended the full retreat all day on Saturday and Sunday, also held at the Meditation Temple. Although the topics of death, impermanence, letting go, and awakening through dying are not favorites in our western culture, the information given by Anna was very pertinent to all and the spirit throughout the retreat was joyful and full. How to hold and use the most helpful attitudes while traveling our last journey on this planet was shared by many in small circles and as a group with Anna's kind, soft, and experienced guidance. The call from everyone was to have this retreat again in the future! Fred Cooper returns to continue teaching on the Mahamudra. A dharma talk "Lessons from the Three Year Retreat, Part 3: View, Meditation, and Conduct--a Dharma discussion with Karma Yeshe Chodron and Karma Zopa Jigme" will be held at 2 pm the Herman Rednick Center, 40 Lorien Road, Questa NM. There will not be a potluck lunch preceding this talk, as before. Dharma discussion format will be that each speaks briefly to set the stage for the topic, then opening up to attendees for questions and dialogue. Suggested donation: $15 for the day. No one turned away for lack of funds. Please donate if you are able, as our teachers can receive a Center donation in gratitude for their kindness and efforts to come to Questa to teach. Karma Zopa Jigme and Karma Yeshe Chodron are students of Kyabje Bokar Rinpoche, and have been full time practitioners of Tibetan Buddhism for over fifteen years. Since 2005, they have been teaching and translating Dharma texts and oral teachings from Tibetan to English for Rigpe Dorje Institute at Pullahari Monastery in Nepal. In 2016, they successfully completed the traditional Karma Kamtsang three-year retreat at Vajra Vidya Retreat Center in Crestone, Colorado, under the supervision of Kyabje Thrangu Rinpoche, with Khenpo Jigme and Khenpo Lobzang Tenzin as their retreat and philosophy masters. For more information call Lou McCall at (575) 586-2058; lou@pixelcircus.org. A public talk on Friday at 7:30 pm, a 2-day retreat on Saturday and Sunday. reserve your place for the Retreat with Maria Mikhailas, at maria153@taosnet.com by Wednesday, Aug. 16 with a non-refundable $20 deposit.